There is a time and place in our walk with God in which He sets us in a place of waiting. It is a place in which all past experiences are of no value. It is a time of such stillness that it can disturb the most faithful if we do not understand that He is the one who has brought us to this place for only a season. It is as if God has placed a wall around us. No new opportunities--simply inactivity. During these times, God is calling us aside to fashion something new in us. It is an isolation chamber designed to call us to deeper roots of prayer and faith. It is not a comfortable place, especially for a task-driven workplace believer. Our nature cries out, "You must do something," while God is saying, "Be still and know that I am God." You know the signs that you have been brought into this chamber when He has removed many things from your life and you can't seem to change anything. Perhaps you are unemployed. Perhaps you are laid up with an illness. Most religious people live a very planned and orchestrated life where they know almost everything that will happen. But for people in whom God is performing a deeper work, He brings them into a time of quietness that seems almost eerie. They cannot say what God is doing. They just know that He is doing a work that cannot be explained to themselves or to others. 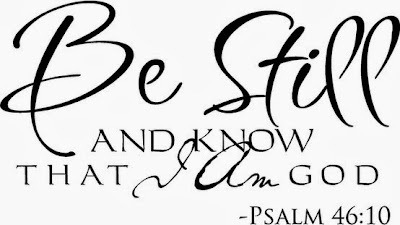 Has God brought you to a place of being still? Be still and know that He really is God. When this happens, the chamber will open soon after. I am a pastor's wife & we have been at our current church for 2 yrs. I am in the isolation chamber. I KNOW that God is working ...on me & in our little church, but I can't put my finger on it. I have worked our entire ministry life (23 yrs) & I feel as though I'm doing nothing now to contribute to our family. I am very lonely here. I must say, God is doing a work in me though. When there is noone else around, God truly is your best friend. This is an uncomfortable place (the isolation chamber), but definitely a place of growth.